A clipping indicator is a useful accessory on any audio amplifier. It indicates when the amplifier has reached its limit and is clipping the peaks of the audio signal. In practice, quite a lot of clipping can occur before you can hear it. So why is it necessary to know when an amplifier is clipping if you can't notice it? The answer is that clipping "squares up" the waveform and square waves contain lots of higher-frequency harmonics which can easily damage the tweeters in loudspeaker systems. This circuit is a true clipping indicator as opposed to the level indicators that are commonly used in preamplifier stages. The problem with level indicators is that an amplifier's maximum output power is not constant. That's because the amplifier's supply rails are not regulated and so the maximum power available at any given instant varies, depending on the applied signal. 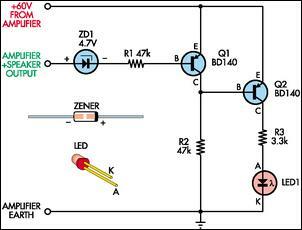 The circuit is quite simple and is based on two BD140 PNP transistors and zener diode ZD1. During normal operation, Q1 is turned on via ZD1 and R1. As a result, Q2 is held off (since its base is pulled high) and so LED1 is also off. However, if the output signal subsequently rises to within 4.7V of the positive supply rail, Q1 turns off since it no longer has any forward bias on its base. As a result Q2's base is now pulled low via R2 and so Q2 turns on and lights LED1. (Note: the 0.6V drop across Q1's base/emitter is ignored here because ZD1 conducts before its rated voltage due to the very low current involved). Why choose 4.7V below the power rail as the turn-on point? The reason is that, due to the drive limitations and the nature of emitter followers, they can be expected to have at least 4V across them when they saturate (ie, clip). ZD1 can be increased to a 5V or 6.2V type if the circuit is to be used with a monster amplifier. The value of R3 should be customized according to the amplifier's supply rail, so that LED1 operates with the correct brightness. To do that, first measure the amplifier's positive supply voltage, then use Ohms Law (R = V/I) to calculate the value of R3 for a current of about 20mA. As it stands, this circuit can only be used to monitor the positive-going half-cycles of the audio waveform. If you want to monitor the negative half-cycles as well, you will have to build a second circuit with the following changes: (1) reverse both LED1 and ZD1; and (2) use BD139 (NPN) transistors for Q1 & Q2. Note that, in both cases, you should use the earth inside the amplifier, as the speaker negative may not be earth (such as in a bridged output).